Lock in a great price for Pansion Mamica – rated 9.1 by recent guests! The staff at the hotel were absolutely lovely. They took excellent care of us and went out of their way to help us coordinate check in with our friends. The food was amazing as well, I would highly recommend the Gnocchi. Their breakfast is exceptional. They made us omelets and were extremely kind to accommodate our special dietary needs. Bardzo przyjemny pensjonat. Przesympatyczna obsługa. Cisza, spokój, pyszne jedzenie. Polecam ! Очень комфортные апартаменты. Удобные кровати и хорошая звукоизоляция.Завтрак обильный и вкусный. Rendkívül bőséges volt a reggeli, kedves a személyzet. Дуже чисто, нові меблі, неймовірно смачний сніданок, чудова кава. Das Personal war sehr freundlich. Wir durften schon vor der Check-In-Zeit in unser Zimmer. Geräumiges Zimmer mit gut funktionierender Klimaanlage. Duschen in der badewanne haben wir Zuhause auch, also kein Problem. Richtig gutes Frühstück! Wir bekamen auch gute Tipps für die Umgebung, z.B. Schnapshersteller Petkovic. Die Unterkunft ist hervorragend für Durchreisende, zumal ganz in der Nähe relativ kleine und unbefahrene Grenzübergänge sind. Featuring an award winning restaurant, Rooms Mamica is located in the village of Pušćine, 3.1 mi from the baroque town of Varaždin. It offers rooms with wooden furniture and free Wi-Fi. Biking, swimming and fishing opportunities can be found in the vicinity. All rooms are renovated in 2008. They come with parquet floors and feature a private bathroom. Amenities in each room include air conditioning, a mini-bar and a flat-screen satellite TV. 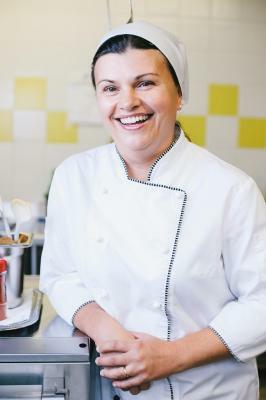 The Mamica’s à-la-carte restaurant serves traditional cuisine from Međimurje Region. In the summer its guests can enjoy al fresco dining on the restaurant's terrace. A selection of local wines and more than 40 cocktails are offered at the bar. Marked biking trails pass next to the property. Bike rental for up to 40 bikes can be arranged on site and bike tools are at guests’ disposal free of charge. Excursions, fishing trips and horseback riding can be organized with the hotelier. 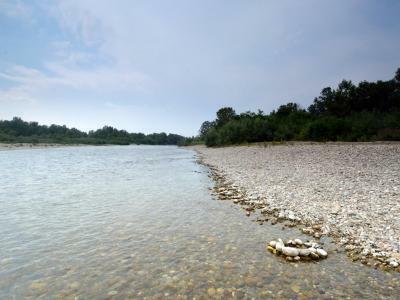 Pebbly swimming area on Drava River is a 5-minute bike ride away. 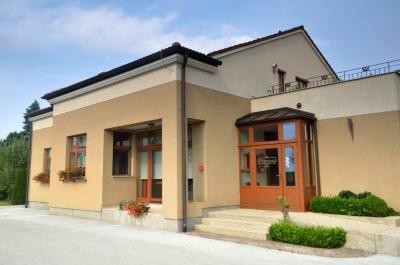 A local bus stop with lines to Varaždin and Čakovec is right in front of the Rooms Mamica. The nearest grocery store is 500 feet away. The Main Bus and Train Station can be found in Varaždin. The town of Čakovec is 4.3 mi away. Sveti Martin Spa Center can be reached within 16 mi. 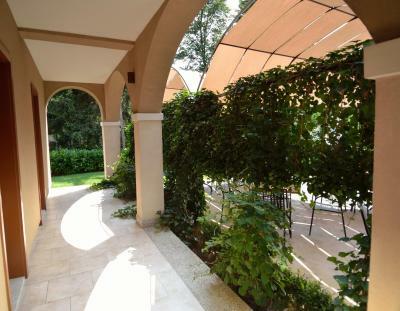 This property also has one of the top-rated locations in Pušćina! Guests are happier about it compared to other properties in the area. 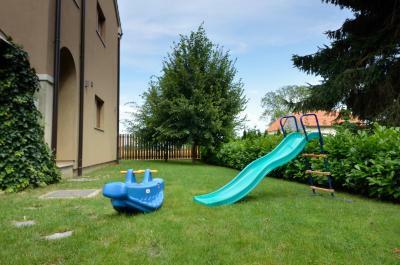 This property is also rated for the best value in Pušćina! Guests are getting more for their money when compared to other properties in this city. When would you like to stay at Pansion Mamica? This air-conditioned room comes with wooden furniture and features customized bathroom with shower and a hairdryer. Amenities include a flat-screen satellite TV and a mini-bar. This air-conditioned room comes with wooden furniture and features a terrace with sun loungers and a bathroom with shower and a hairdryer. Amenities include a flat-screen satellite TV and a mini-bar. 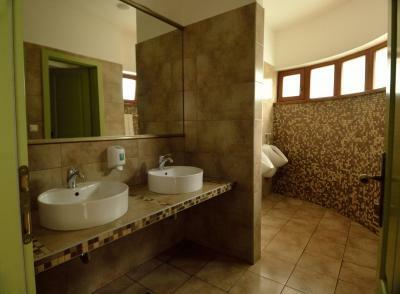 This spacious air-conditioned room comes with wooden furniture and features a bathroom with a bathtub and a hairdryer. Amenities include a flat-screen satellite TV and a mini-bar. This air-conditioned room comes with wooden furniture and features a bathroom with shower and a hairdryer. Amenities include a flat-screen satellite TV and a mini-bar. House Rules Pansion Mamica takes special requests – add in the next step! Pansion Mamica accepts these cards and reserves the right to temporarily hold an amount prior to arrival. My only complaint is that the bathrooms could use some updating. They looked a bit dated, and the bathroom fan blew little grey fluff on the sink when turned on. It was very clean, though, and we were well stocked with towels. I would also have appreciated it if they included more soaps and body care products, we were only given one multi-use liquid for hair and body. Bathroom needs refurbishment, but functional and clean!